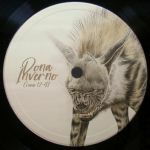 Review: Given that Simoncino has never hidden his admiration for early deep house producers - much of his material sounds like it was inspired by Larry Heard, the Burrell brothers and Lamont Booker - it's unsurprising to find that his latest EP pays tribute to legendary NYC deep house producer Bobby Konders. Stylistically, this isn't much of a shift; as usual, Dreams of Konders comes swaddled in dreamy pads, vintage synthesizers and the unmistakable pulse of original analogue drum machines. Simoncino explores a range of moods - from the deep space swirl of "Meggaton" and chugging pulse of "Pyramids", to the snuggly warmth of the title track - with the faintly foreboding "Space Is The Place" standing out. Review: On his two previous albums, 2012's The Dream of Amnesia and 2013's Open Your Eyes, Simoncino indulged his love of vintage deep house, variously doffing a cap to Larry Heard, Dream 2 Science, the Burrell Brothers and Lamont Booker. On Amazon Atlantis, he's flipped the script, utilizing his vast bank of classic synthesizers and drum machines to pay tribute to the sci-fi inspired sounds of 1980s Detroit techno. Of course, there are a few nods towards his deep house influences (most notably the Vincent Floyd hook-up "Memories Of Summer"), and a couple of curveballs - see the apache break and ambient house textures of "90's Theme" - but for the most part it's a delicious Motor City tribute. Perhaps the most stunning example of this is "Planet Paradise", a brilliant collaboration with Legowelt.